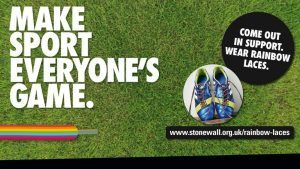 LGBT inclusion in sport and the importance of fighting homophobia, biphobia and transphobia were once again brought into sharp focus this year thanks to the Rainbow Laces campaign, and particularly its activation in November. For 2017, the period of action in the UK ran to a whole 10 days, from Friday 24 November to Sunday 3 December. More than ever before, a show of support was visible across the whole of British sport – plenty of rainbows deployed in various colourful ways, but also plenty of talk and recognition around the issues that still affect how people who are lesbian, gay, bisexual or transgender, of all ages, interact with sport. I’m troubled about why there is this curiosity about a gay player… The media has a huge part to play – it has to be dealt with sensitivity and understanding. I’m not so sure that that’s going to happen. There’ll be a ripple effect – his family, everyone that’s involved with him are going to feel it as well. Unfortunately you know how some aspects of the media work – they will follow everyone, and that’s a difficult thing. Mortimer’s comments echo many of our own concerns as a network about how the media covers LGBT people in sport – past, present and future. You can watch the full Sportswomen Facebook Live discussion on LGBT inclusion in football below. Considering lesbian, gay and bisexual people make up an estimated 7% of the UK population, there continues to be a lack of ‘out’ men and women in elite British sport, even taking into account that some will always wish to keep their sexual orientation private. Wakefield Trinity prop Keegan Hirst is, to the best of our knowledge, the only out gay man in professional rugby league (correct us if we’re wrong) – he spoke to Build London’s Matt Bagwell for RL Week, as part of their interview series in partnership with NOW TV. A team is only as strong as its weakest link. If someone, in any environment, if they’re not being their authentic self, if they’re not bringing their whole self to the party, then they’re not giving their whole self to the job. The team isn’t functioning as well as it can. My performance as an individual went through the roof, and it continues to do that. If you can talk about [your problems and issues] and share it with the team, it brings you closer together – and a close team functions better. People respect you for being honest. The benefits of being open and honest, and how that impacts on an individual and on their team, are another crucial aspect of the whole Rainbow Laces picture. I genuinely believe the answer lies within all of us – players, coaches, supporters and members of the media. We all have to question our everyday habits, language and behaviour in order to help all members of our society to be comfortable and safe, whether LGBT, black, white, Christian, Muslim or any other denomination. Great piece Liam, applaud your sentiments. Sometimes it does need an individual to make a difference, I’m really hoping somebody in the Prem comes out. For all of the good work with campaigns and good words, we need a human face to this, it’ll give everyone else confidence and if it smokes out a few bigots, then all well and good. I’m a straight bloke and I proudly wear my rainbow laces in the summer at baseball and in the winter in Veterans’ football – it says a little bit that I’ve never had a single negative conversation about them. Having an ‘out’ Premier League player is by no means integral to the continuing progress of LGBT inclusion in sport… but boy, would it help. We all recognise the likely extent of the pressure, the responsibility, the media intrusion and many other ramifications that would ensue from that moment when a professional footballer (at any level, in all honesty) publicly says ‘I’m gay’ or ‘I’m bi’. But in doing so, that footballer would also be saying ‘I’m human’ – mortal, flesh and blood, emotional. Our reactions will show our humanity, and confidence will spread. “We were actually complimented on it by a whole number of people, so we are glad we did” – the Football Association’s chief executive Martin Glenn, after he and FA chairman Greg Clarke wore Rainbow Laces pin badges at the 2018 World Cup draw in Moscow in December. It was a tough year for Clarke and the FA on matters of diversity and inclusion, but on the LGBT front, there was a marked improvement in terms of visibility and engagement. The LGBT community is a big part of society, and therefore should be a big part of football as well. An honour to chat with @joe_bryan179 after tonights win. In mid-November, I wrote on this website of how it was vitally important that the media helped explain why the Rainbow Laces campaign was needed. Some distinguished sports journalists and editors did just that, writing informed and entertaining columns that got to the heart of the issues involved. Sam Wallace (The Daily Telegraph): In a changing game, why did so few players wear Rainbow Laces? Maybe gay footballers no more want to be defined by something as irrelevant as their sexuality, as straight footballers do… maybe instead of secret coffee mornings, that should be the message the FA re-inforces. Nobody cares. Just live your life, play your game. Nobody cares. Why would you sign up for that potential risk if it’s working for you, if you’re happy? You might think, ‘Why do I need to share my sexuality with anybody?’. I respect that. Where I worry is that there may be people who want to be openly gay but don’t feel able to be openly gay. If they do, they should be comfortable, accepted and supported. The issue we should all care about is exactly that – that there are gay and bi male footballers who want to live authentic lives, but don’t feel they can. Clarke will continue to be criticised, and at times he will likely deserve it, but there’s evidence here to suggest he’s listening to LGBT people more closely than his detractors are. Wake up and smell the coffee, Martin. A clever social media takeover that picked up loads of traction and also sent a significant message, not only to those who have represented Great Britain at the Olympics who are LGBT (there were at least eight at Rio 2016), but also anyone who dreams of competing for their country at a Games in the future. What were your favourite Rainbow Laces moments of 2017? What do you hope to see from the Stonewall campaign in 2018? Leave a comment below to let us know. This entry was posted in The LGBT Line. Bookmark the permalink.